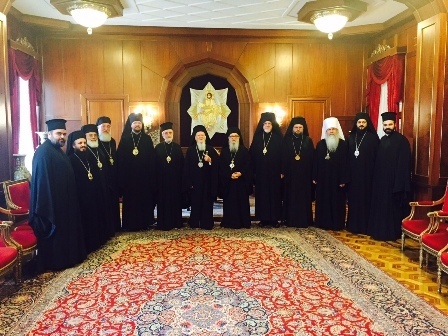 Istanbul—On Tuesday, June 16, 2015 His All-Holiness Ecumenical Patriarch Bartholomew warmly received the Executive Committee of the Assembly of Canonical Orthodox Bishops of the United States of America at the Phanar in Constantinople. Joining the Ecumenical Patriarch, Elder Metropolitan John of Pergamon discussed the mission of the Assemblies of Bishops as originally envisioned at their inception in Chambésy in 2009. Both the Ecumenical Patriarch and Metropolitan John commended the efforts of the US hierarchs, and acknowledged their work as a model for inter-Orthodox cooperation.